Genlantis now offers a large collection of pathway reporter stable cell lines, all using a highly active luciferase reporter system. Signal transduction pathways are the bridges that connect the extracellular environment cues, for example the binding by a specific cell surface receptor of a hormone, to the ensuing cellular response. These signaling pathways are composed mainly of proteins that can interact, move to specific cellular locations, or be modified or degraded. Understanding the function of proteins in normal versus abnormal cellular environments is an important key to drug discovery processes. Having a clear knowledge of how a protein regulates signaling and metabolic pathways is a first step in disease research. Malfunctioning protein and/or signaling pathways are therefore very important in understanding the mechanism of a particular pathology, and may lead to the proper investigation of the cause of a disease, especially for cancer, and can also lead to possible targeted solutions. 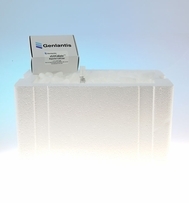 Genlantis is pleased to offer a substantial collection of high quality Luciferase expressing reporter cell lines. The eLUCidate Reporter Cell Lines have been constructed with an optimized and highly active luciferase reporter technology. The variety of cell lines and transcriptional activators that Genlantis offers allows scientist to study the behaviors of multiple pathways of interest by monitoring luciferase activity after exposure to drug candidates or other stimuli. The eLUCidate Reporter Cell Lines allow users to measure the potency and selectivity of compounds on key pathways, especially if used in a high throughput system.